Click here to see these in stereo. Here are all five regular polyhedra (of index two). By name, going from left to right, they are the ditrigonal dodecadodecahedron, dodecadodecahedron, Ef1g1, medial rhombic triacontahedron, and De1f1. 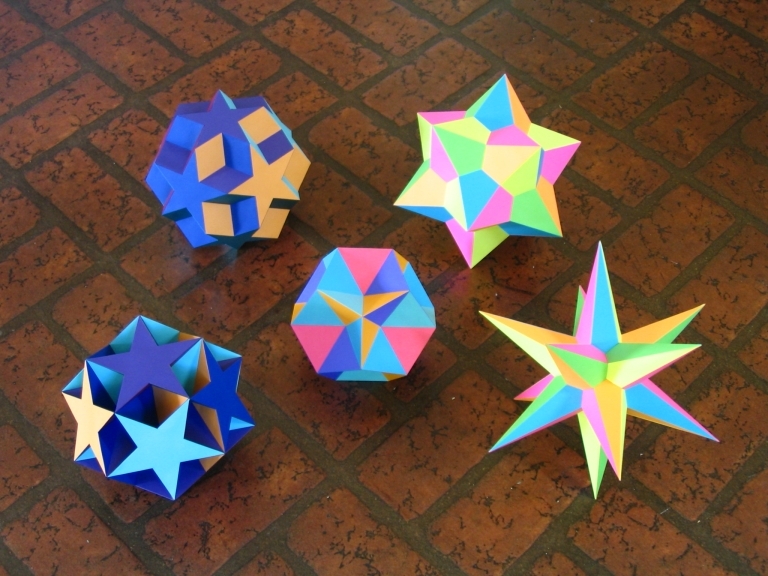 The first two are uniform polyhedra, the third and fifth are stellations of the regular icosahedron, and the fourth is a stellation of the rhombic triacontahedron. The labels for the icosahedra are from The Fifty-Nine Icosahedra by Coxeter, et al. These polyhedra have index two because, for each polyhedron, the symmetry group of the immersed polyhedron is a subgroup of the full symmetry group of the polyhedron, and the index is two. As it turns out, the direct product of C2 and S5 acts on each of these polyhedra, but the symmetry group of each immerseed polyhedron is isomorphic to the symmetry group of the regular icosahedron, which is isomorphic to the direct product of C2 and A5. Note that C2 is the two-element group, S5 is the group of all permutations on five letters, and A5 is the group of even permutations on five letters. One can find a proof that there are only five regular polyhedra (of index two) in the last reference cited below. The following table gives some data for these polyhedra. Notice that each of these polyhedra has 60 edges. The "valence" is the number of edges emanating from each vertex. All these polyhedra represent closed, connected, and orientable surfaces, so the only remaining invariant is the genus, and this is also given for each polyhedron. Table. Data on the Regular Polyhedra (of index two). The polyhedra are arranged in the photo so that a reflection about a vertical line yields a duality. Thus, the ditrigonal dodecadodecahedron and the icosahedron De1f1 are duals, the dodecadodecahedron and the medial rhombic triacontahedron, and the icosahedron Ef1g1, remarkably, is self-dual. This should also be evident from looking at the data in the table. H. S. M. Coxeter, P. Du Val, H. T. Flather, J. F. Petrie. The Fifty-Nine Icosahedra. University of Toronto Press, Toronto, Ontario (Canada), 1938. J. M. Wills. The combinatorially regular polyhedra of index 2. Aequationes Mathematicae 34 (1987) 206-220.